Whether you’re a new entrepreneur or veteran SMB owner, chances are you’d like to improve your PR efforts. Here's a guide to help you do it yourself. Whether you’re a budding entrepreneur or veteran SMB owner, chances are you’re aiming to better publicize your message to a given target audience. Whether it’s customers, prospects, or partners, there is a target group you want to engage. Whatever the case, there are tools and strategies you can use as an SMB owner to build your social and PR game plan. And, it doesn’t involve a monthly retainer. Chicago-based PR firm, Walker Sands Communications has helped us compile a number of tips to help SMB owners publicize their company, sans agency. We’ve built on each of their recommendations, to give you a fuller picture of how you might go about achieving marketing success! A key for a small business to gain credibility within their industry is to establish their own team as thought leaders in the space. As a small business owner, there are probably people you follow on social media for advice and to stay abreast of important news. Try to engage with these people on Twitter and LinkedIn. It will likely increase your visibility on these platforms with relevant audiences and build connections that may be useful in the future. If you’re wondering what you can do, start by familiarizing yourself with platforms that will help you identify influencers, including Followerwonk, Tweepi, and Keyhole. You can use these platforms to find Twitter influencers who could make a big impact by spreading the word, if you are successful at building that relationship. Two days ago, UK unicycling enthusiast, James Shields, published an app called “Learn to Unicycle.” As of today, nothing has yet been done to publicize the app, primarily so that James can work through any technical issues if they do exist, but also because he’s pretty new to the business of marketing. When he asked me where he might start, I suggested Twitter because this is the platform that makes interacting with people you don’t know—but who may have influence—easiest. And, it’s one of the fastest ways to get word out! 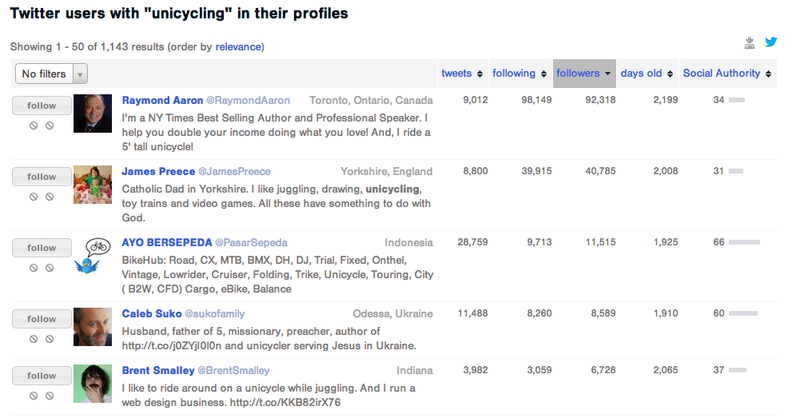 Beyond using Twitter’s search feature to find people who may be interested in what you’ve got to offer, Followerwonk takes the guesswork out of things. If you do already have a Twitter account, you can login using those credentials. Once you’ve done that, a keyword search, say on “unicycling,” will return a list of people that have the word in their profile or their bio. From here, you can filter the users based on what you’re looking for. Perhaps you want to target someone with 100,000 followers? Or maybe their “social authority” is more important? Or, perhaps it’s the number of times they tweet? Rather than picking just one of these categories, I suggest looking at them as a whole. Try to figure out what they mean for you. If someone tweets very little, you’re going to have to work a whole lot harder to get them to mention you. And, if their follower count is non-existent, don’t think that following them will mean they follow you. But, even if someone does have a low follower/tweet count, if they have good social authority, they may be worth your time. Consider building a relationship with them because if they do mention you, chances are, you’ll have a much easier time getting picked up! And, don’t be afraid to read peoples’ Twitter feeds. I’m not advocating creepy stalking, but they are public and as such, totally acceptable for general perusal. You never know what you could learn or what interests you could share. While engaging with thought leaders is one great way to start getting your own business’s voice out there, becoming a thought leader yourself will be something you’re in for the long haul. A good way to get started is to either maintain a regular blog like marketing expert Seth Godin does, or to make use of platforms that will allow you to blog and reach your target audience. In case you didn’t realize, LinkedIn has become one such platform. Previously, only a select number of well-known influencers could share their thoughts on LinkedIn’s news platform, Pulse. Now, it’s open to everyone. Make use of this platform if you want to establish yourself as a leader in your field. Where to go to write a post on LinkedIn—your home feed. Author and small business expert Deborah Shane has compiled a great article on the things you should keep in mind if you want to master LinkedIn’s publishing platform. If nothing else, at least make sure you’ve got a catchy subject line! Start by adding the clients and customers you already do business with—if this is appropriate—and then begin writing content that will make you stand out and that clients will find helpful. Make sure to reply to anyone that comments. This goes for all social platforms. If people take the time of day to interact with you, make sure you do the same with them. Another aspect of becoming a thought leader is creating original content that benefits your target audience. Blog posts, white papers, case studies, and webinars are great vehicles for establishing your credibility and expertise. Even better, these assets are easy to share via email and across social media, ensuring maximum visibility. The best way to learn to market is to snoop! How are other people in your industry doing it? How are people outside of your industry doing it? What will your audience find useful and where are they most likely to spend time online? If it’s in their email inbox, perhaps newsletters should be your focus. In the digital world, we refer to “content creation”—for the purposes of marketing and branding—as content marketing. While this is not technically a new practice (even John Deere did it in the late 1800s), it’s a practice that has arguably replaced many old SEO tactics. Today, this is how you get found online. And, the better and more useful the content you create, the more likely it will be to go viral. To get yourself up to speed on how others are handling their content marketing strategy, have a look through some of the free ebooks on the Content Marketing Institute’s website. My favorite one is the Content Marketing Playbook, which you can also view as a slideshare. Spend some time thinking about the format of content that your target audience will find most useful, and don’t be afraid to experiment. If you’re not au fait with the terminology, a hashtag is simply a keyword that you can attach to content you share online. It begins with the # symbol and does not include any spaces. The use of a space will break a hashtag in two, making only the first part relevant and thus, negating the point of using it! So, #30DayChallenge broken up becomes #30 and really, who is searching for the hashtag #30? Usually, you attach a hashtag to a tweet on Twitter, or something you share on Facebook or Google+. Sites like Instagram also use hashtags to make content more searchable. If you’ve never used hashtags before, it’s a good idea to use pre-existing tags rather than to create your own. If you do use pre-existing tags, be careful about how you use them. After all, you don’t want to “hijack” a tag with negative connotations—like Jell-O did with their #FML fiasco—and attribute it to your brand. Just be careful, do your research, and think about how your followers and non-followers might use this tag now and in the future. Could it negatively impact your business? If there’s the slightest chance it could, don’t use it! If you’re not sure what hashtags already exist and whether or not they’re popular, take a look at Twubs or Hashtagify. Once you’ve mastered using a hashtag to increase your post’s own exposure, try creating your own. Our hashtag, #TrackThis, is one we created to be used exclusively alongside webinars that feature Palo Alto Software’s CEO, Sabrina Parsons, discussing topics relating to the right metrics to track in a business. Sometimes, using more than one hashtag can help clarify what you are referring to. This is particularly important if you’re using a tag that has many applications, like #30DayChallenge. While we used this tag to link all of our posts related to starting a business in 30 days, others on Twitter use it to refer to 30 day yoga challenges or other workout challenges. This doesn’t mean we can’t use the tag too, but it does mean we risk people not subscribing to this tag because they have no interest in workout related challenges! They’re only in it for the business. To solve this problem we can either create our own tag, or we can use another tag, in conjunction with our #30DayChallenge tag. 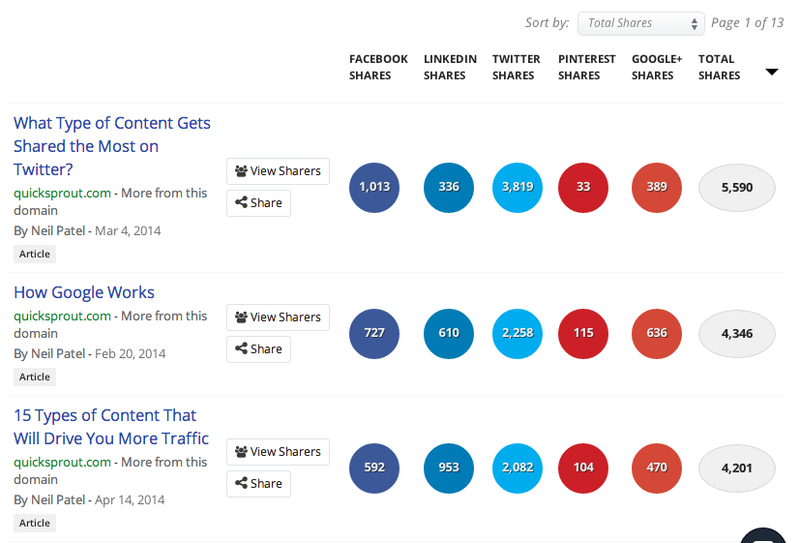 If you want to keep an eye on how your content is performing, BuzzSumo is a great tool to experiment with. We even use it at Palo Alto Software to keep an eye on the type of content that’s doing well across our key social networks. Best of all? You can use it to check on your competition. What’s trending? What is most shared on Twitter? Neil Patel runs a great blog on Quicksprout. If you need to buff up on your marketing skills or are looking for a place to get started, you’ll find valuable advice here. A quick glance at the posts that were most popular for Neil this year reveal that Twitter wins hands down. If Neil’s top article is anything to go by, that’s probably because the first post is directly relevant to a Twitter-based audience, the second is a “how-to” type post, and the third is a list post. Both these formats are popular on platforms like Twitter. Google Alerts: Monitor when your brand gets mentioned, and additionally, where you get mentioned. Perhaps someone gave you credit for something you’ve done, but forgot to reach out to you. If you’re using Google Alerts, you can stay on top of any mentions. SocialMention: If you want to know what’s being said about a particular term across blogs, video, and social media, use this tool to find out. SocialMention lets you see how many times a term has been mentioned and how often. You can even subscribe to an RSS feed so that you don’t miss out! A great way to establish relationships with reporters is to offer yourself as an expert source to comment on hot stories in the news. For instance, if you are a software company that builds calendar applications for businesses, you would likely have an informed opinion on Google’s new calendar app. Reporters are always looking for experts that can give their stories substance and new angles. Yesterday, we did exactly this. Take a look at the post we published, “Midterm Election Issues Entrepreneurs and Small Business Owners Should Keep an Eye on.” While we certainly don’t claim to be political savants, we do keep watch on issues, like corporate tax legislation, that could affect small business owners. For this reason, we don’t just report on those issues that are trending, we report on those things that our audience will find useful and relevant. Being “timely” is everything. If you can figure out what the “mood” of your industry is at any given moment, you’ve got it made. Occasionally, I will use Google Trends to check up on whether something is declining or growing in popularity. For example, a search for the term “LivePlan” reveals that search volume for our business planning software and business management dashboard has more than tripled in the last three years. Crazy, right? Now take something that’s been in the news a lot and more recently—like Ebola—and Google will even pinpoint some of the news headlines that give you insight into what is going on. You’ll have to head over to the Google Trends page if you actually want to see those news stories plotted on the graph, but the point is, that if you catch the trend early enough, you may well be able to ride the wave and be a go-to source for people looking for real-world insight into your niche. What matters to the people in your industry? Figure that out and then keep an eye on the news. Social media and content monitoring tools like BrandWatch and Radian6 are great tools for tracking your brand’s online presence and are favorites of public relations firms. But these products can be expensive, especially for a small business. Fortunately today, “freemium” products are a dime a dozen. Tools like SproutSocial, BuzzSumo, Hootsuite, HelloBar, and Buffer may not give you all the features you want to be able to monitor your online performance and presence, but they’ll give you enough to manage the basics, or until you decide you can afford to upgrade to a premium account. It’s clear that brands have to be on social media in order to be relevant, but not all platforms are right for your brand. Identify your target audience and see where they get their content. Do they prefer Twitter, LinkedIn, or Facebook? Would they even look at your Pinterest or Instagram account if you had one? Each platform can be used to focus on a certain part of your key messaging as long as the content will reach your target audience. Otherwise, it’s a waste of your time and it’s not a great representation of your business. Far better to do less and do it well, than to do everything and to do it poorly. If you’re not sure whether or not your audience is on a particular platform, take a look at research conducted by the Pew Research Center, on social networking. 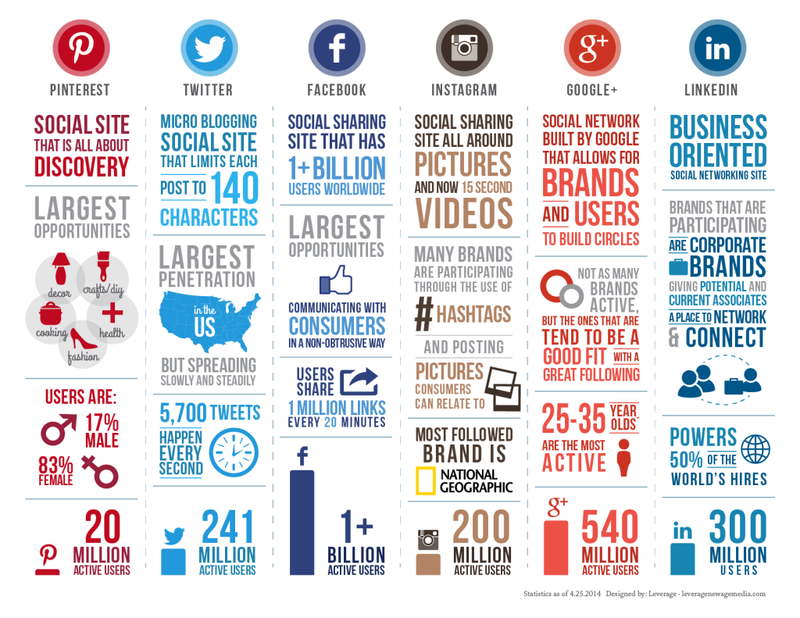 You can use this fact sheet to determine where your demographic is spending their time online. It’s a lot easier to pick a platform if you already know what each of these networks is used for. Scott Levy, author of “Tweet Naked” and founder of Fuel Online, dedicates a portion of his book to helping you figure out which social media platforms you should embrace. In this extract, you’ll quickly glean the main things you need to know about the biggest social media players: Pinterest, LinkedIn, YouTube, Twitter, Facebook, and Google+. And, if you’re still not sure, here’s an infographic that covers it nicely. While statistics may be slightly out of date (original publication was 2013), for all other purposes, it’s still a solid guide. While on social media, be sure to engage with customers who are having conversations around your brand or about a topic relevant to your business. When you monitor what people are saying on your social accounts as well as the keywords that relate to your business, it is easy to see what people think is important. This is also a smart tactic for staying on top of customer complaints and controlling the conversation before it gets out of hand. Social listening tools like Hootsuite make this easy to do. Simply link your accounts to the platform and you can pull them up in a single handy dashboard. 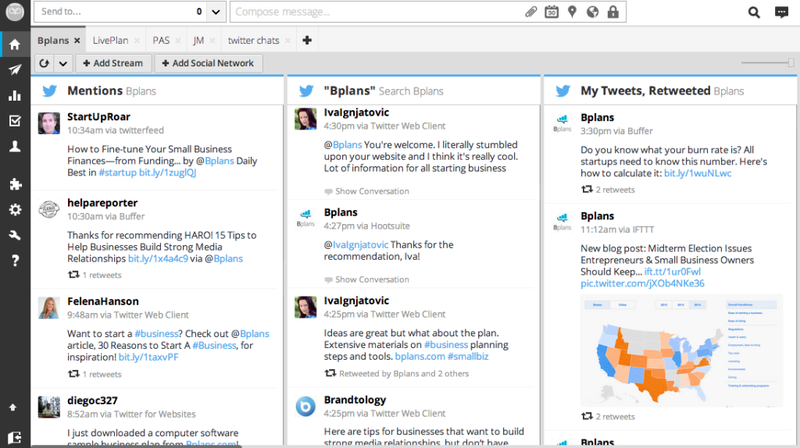 Here’s a glimpse of one of our Twitter tabs in Hootsuite. You will see that we’ve elected to show streams/feeds of those tweets in which anyone mentions us directly using the @ tag, in which anyone simply mentions Bplans, and a column for retweets. We do have seven additional streams tucked off to the right as well and that’s all just for Twitter! Occasionally, you’re also going to be wondering how to respond to someone’s comment. Perhaps they have expressed a negative opinion, or said something that simply isn’t true. While we do still advocate almost always responding—as do most PR firms—how you should respond isn’t always clear. That’s why, when you’re left wondering, think about perusing our social media response flow chart. And, if all of this sounds scary and you’re thinking about abandoning all platforms, consider this: Not having an online presence or a social media presence doesn’t mean people are not still talking about you. It simply means that you are not monitoring and engaging with those conversations. Technically, this can be worse. Many companies use social media platforms like Twitter as customer service platforms. 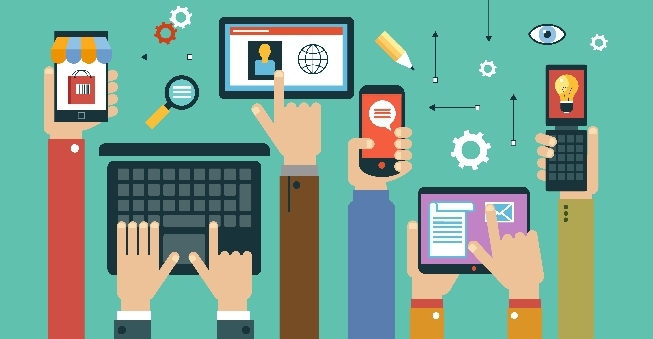 Take a look at how Zappos, Verizon, and these 10 UK brands respond to user interactions online. Remember though, if you are going to create an account exclusively to be used for customer service purposes, you’re going to make sure you’ve got someone monitoring it on an almost constant basis. In fact, research conducted by Lithium Technologies found that 72% of users expect to hear back from a brand they’re interacting with on Twitter, and 53% expect a response within the hour. The bad news is that 60% of the individuals surveyed said that if they don’t hear back in a timely manner, they would feel more negatively toward the brand, with 29% of individuals telling friends and family about their bad experience, 26% escalating the issue through other modes of communication, 24% considering buying less from that company in the future, 21% who wouldn’t recommend the company’s services and products, and a further 15% who would complain about the company/brand via social media. So, if you get on it, decide to be on it. Do you have any other PR tips for SMBs looking to save on hiring a PR firm? What tools or resources do you use to manage your online presence and to market your business? Share your thoughts with us in the comments below!